He would have been 17 today. 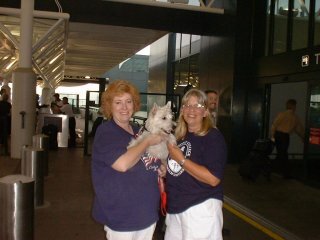 His first picture was actually posted here in July 2002 by my dear friend, Georgia Griffis, who was volunteering at the time for Helping Hands for Little Paws in Little Rock. Roo, as I remember it, was in a kill shelter after having been owned TWICE. I saw his precious face and fell in love,and told Georgia, "I want that boy!" He was eleven months old! Long story short, Georgia pulled him and fostered him at her house until we were able to make arrangements to get him from Arkansas to New York. Just after his first birthday, I boarded a plane in Albany, NY and flew to Nashville, TN. Meanwhile, Georgia and her duaghter Kelly drove from Little Rock to the Nashville airport, and we met up there, where she placed Roo in my arms. On the two legs of the flight home, I was fortunate enough to hold him in my arms, except for take off and landing and that is where our awesome bond was formed. 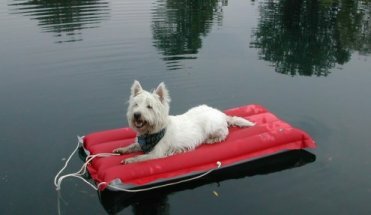 For those who didn't know his story, Roo was one of the longest surviving early members of The Terrier Club, having had many Westie and Cairn friends (and sweethearts) precede him to the Rainbow Bridge. 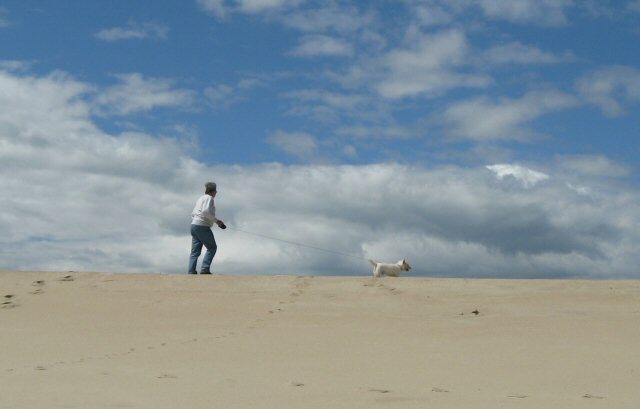 He had a long and wonderful life, filled with love and trust and fun every single day. He was full of mischief and many of his adventures were shared here. On November 20, 2017, it was time for Roo to leave us and join his friends. I still haven't gotten over losing him, and probably will in time, but not for a long, long while. He was my heart. 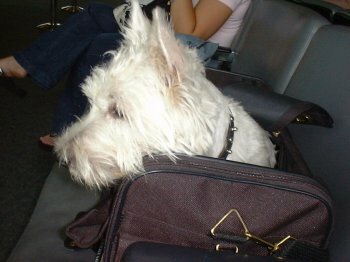 Here's a picture of him at the Nashville airport, sitting in his crate,waiting to come home with me. 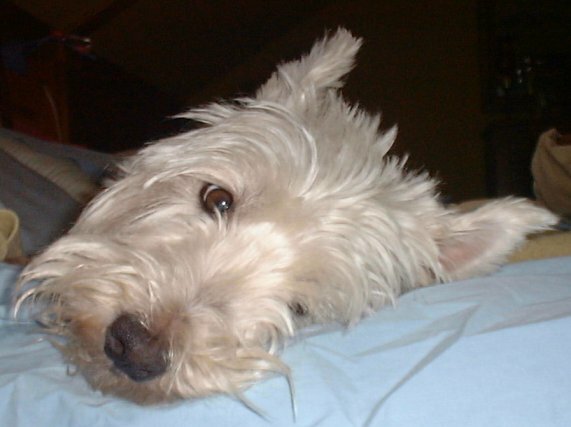 July 2002. on his gotcha day. I miss you EVERY DAY, Roo. Oh Cheryl, so many happy memories of Roo! Bless him, we wish him the happiest of birthdays at RB. I hope he's with his Angel Kelsie and the rest of the TC Angels, having a grand adventure, just like old times. Keeping you in my thoughts and prayers as you miss your dear boy. Mrs. Cheryl, Emmie here! I wishes I woulda known Roo. Mommy says he was one of a kind! I hab giben him my POW fer his lipstick piccie! Dat are such a lubly shade on him! Thank you, Deb and Emmie. He certainly was one of a kind! Cheryl I know how much you miss dear Roo. I remember a lot of his antics but forgot about the lipstick. It brought tears to my eyes but I know he is in a much better place running free at the bridge. God bless him and you for giving him a great home and a life full of love. Thank you, Riley and Allen. Thank you, Louise. I couldn't stop crying yesterday, either. I wonder if my heart will EVER heal. Thanks, Annie. I know you understand the grief. 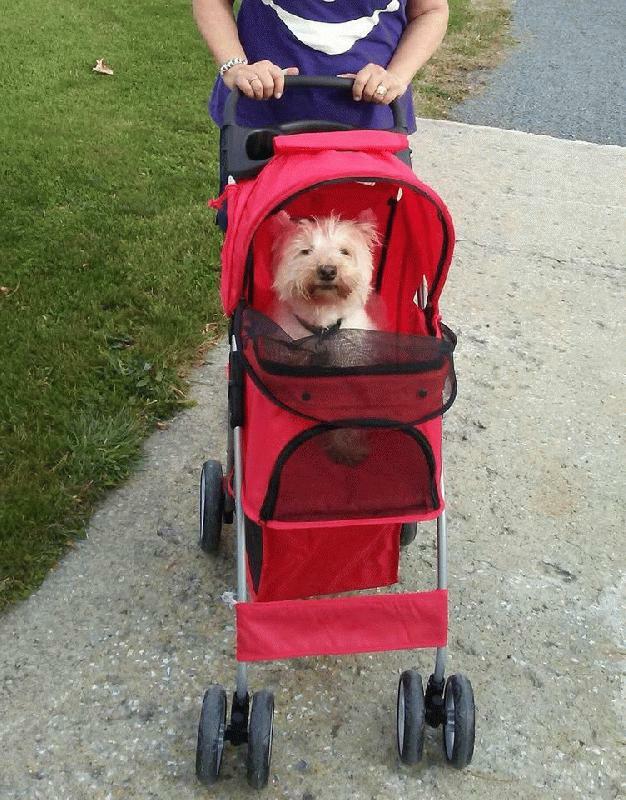 I can't stop crying, Cheryl, Roo was a very special boy. 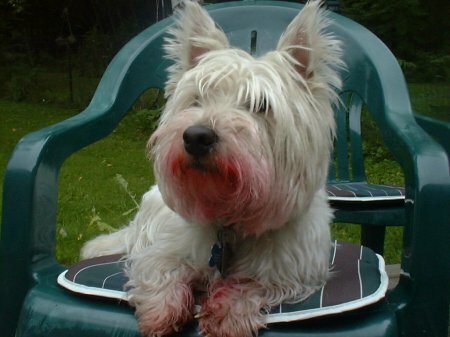 We when first joined TC I remember his WestieAir adventures and of course the lipstick caper. Hope he had a great birthday at the bridge with all of our furkids. He was very blessed to have him in your life and you were bless having him in yours. so much, but Buster will always be that special boy and I will never forget him, just as you will never forget Roo, he will always be in your heart. I spent most of yesterday in tears, and of course, crying as I type this. Sometimes, I wish we could go back in time and hold them, if only for a little while! I feel the same way loosing Moshe. Not a day goes by that I do not think of him. When I open my iPhone a picture of Moshe shows and it was taken a few weeks before he died. We cried a lot for days ,weeks etc. I know how much you miss him. We sure had a great time here on theTC. I still have the pictures that I made when they came to visit here in Ponte Vedra Beach remember? Hugs and love to you dear friend.